Pantone is so well known, in fact, that the numbered hues have become inspiration for designs like the iconic Patnone mugs, chairs and even bicycles. But the Pantone Hotel, which opened last month in Brussels, is the most exciting creation thus far. Designed by Michel Penneman and Oliver Hannaert, each floor of the hotel is assigned a different hue, and reception helps guests choose their floor at check-in based on mood. The rooms themselves are blank white canvases that allow the colorful decor to really pop. Rooms run from $84 to $184 per night, which seems totally reasonable. And if that's not enough to get you to Brussels, how about this? 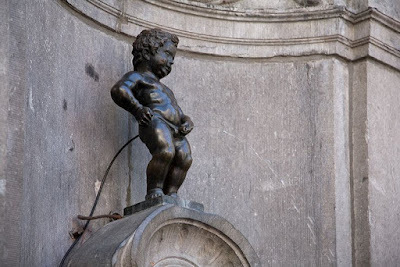 That's Manneken-Pis, and it's literally the only thing I remember about my trip Brussels other than the chocolate. Wish I could visit someday!